Keep your turf safe with our new Ground Protection Mats. Less expensive than fiberglass and much higher quality than plywood, our Ground Protection Mats are a perfect solution when you need a temporary roadway for heavy equipment but don’t want to destroy the lawn. Never get stuck again! 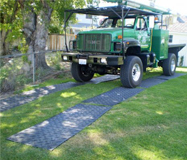 Ground Protect 1: These rugged mats are made of 1/2″ thick recycled polyethylene so they are virtually indestructible. Built to withstand vehicles weighing up to 60 tons, they bend but do not break and feature a Limited Lifetime Warranty. 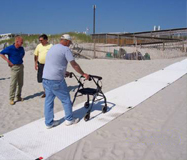 Ground Protection 1 Mats have been tested in record cold and heat. 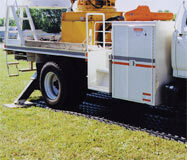 With Ground Protection 1, getting stuck is virtually eliminated. They are available smooth on one side or both. Ground Protect 2: The most versatile ground protection mats available. Designed as a temporary pedestrian walkway, the flat, slip-resistant tread enables your guests to walk safely through rough terrain. The reverse side has the same diamond plate tread as Ground Protection 1, providing great traction for vehicles. When you realize you spent too much on something you should have bought somewhere else. It can be discouraging. But that’s a feeling Greatmats customers don’t have. Every day we are researching our competition to ensure we have the best prices available online. We flat-out won’t be undersold. But everybody says that. So we guarantee it and then some. If you can provide us with a competitor’s quote or show us a lower advertised online price, we will research it. If it is a comparable NEW product, we will provide you with a quote for a better price. We take the difference between Greatmats.com delivered sale price, and the competitor’s delivered price and multiply the difference by 130%. For example: Let’s say our delivered price is $500, and their delivered price is $450. We would take the $50 difference, multiply it by 130%. That gives us $65. We take that $65 off your price and you are left with a sale price of just $435. We hold an A+ rating with the Better Business Bureau. We are the #1 provider of rubber flooring in North America. We are proud to have been featured in several industry magazines as well as HGTV for our exceptional products and value. So if you‚re looking for kids play mats, foam tiles, dance floors, weight room floors, or any other specialty flooring, be sure you check out our selection before you buy from anyone else. Have questions? Give us a call! Introducing a revolution in dance floor technology! 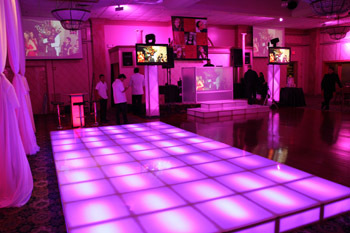 We’re happy to announce that we are now carrying the Bright Lights Dance Floor. 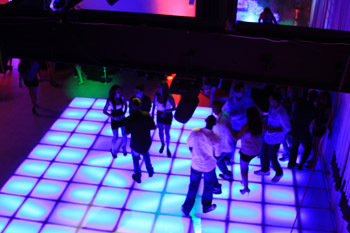 Made 100% in America, the dance floor consists of 2’x2’x8′ sections. Each section is rated to hold up to 800lbs but only weighs 21 lbs. The floors can be installed on any flat surface. They will not damage your subfloors and are remarkably easy to install. Best of all, they light up in a variety of colors and you can control them via remote control! 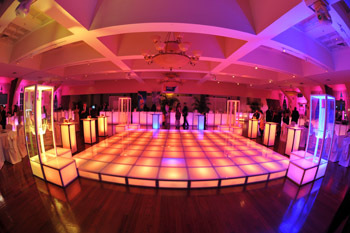 There are no tools necessary to install the Bright Lights dance floor. A series of metal clips are used to connect the pieces. All panels are removable in order to run lighting throughout and allow for easy transportation. Any and All Sizes available. The Bright Lights Dance Floor is very easy to clean. To find out more information on the Bright Lights Dance floor, click below on our product link and don’t forget to like us on Facebook for an additional 5% discount off your purchase! Introducing our newest children’s safety product, The Swing Mat. Designed specifically to keep wood chips and pea gravel under your swing-set and slide where they belong, Swing Mats can improve safety of your back yard. 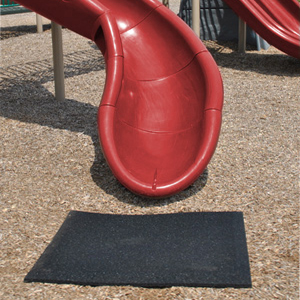 Built from the same high-quality recycled materials as our other PlayGuard products, these mats are built to take a beating. Just loose-lay them beneath your swing-set and at the base of your sliding board and you’re done. Mats are an inch and a half thick so they also provide fatigue relief for little knees and backs. 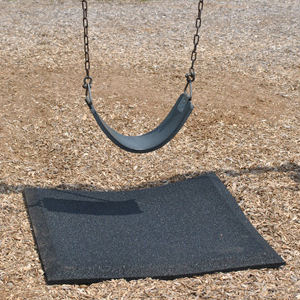 Swing mats are available in black and can lay directly over your playground surface. They are made of up to 92% recycled materials. As with all our products, they come with our 130% price-match guarantee. Don’t forget to like us on Facebook for an additional 5% discount off your purchase! Greatmats.com provides rubber flooring for a number of different functions. Whether you need rubber flooring for a large commercial gym or you’re looking for a couple area mats for the laundry room, they have what you need at the best possible prices. Be sure to recommend Greatmats.com to your friends and check in from time to time and keep checking our blog or Facebook page to keep up on great deals. We’d like to invite everyone to check out our new customer gallery. It’s a great way to see our flooring in and around homes and businesses. Photos are submitted from actual customers who have installed our flooring themselves. Take a look at everything from outdoor kids play mats to a commercial dojo to a residential shower floor. If you’ve bought flooring from Greatmats, we encourage you to submit your photos so we can add your space to the gallery! Remember, if you’re in the market for specialty flooring, you won’t find better products at lower prices than you’ll find at Greatmats.com. We offer a 130% price-match guarantee ensuring that we won’t be undersold. So, whether you’re looking for flooring for a large, commercial gym or just a few play mats to put in the basement for the kids, Greatmats has you covered. Our friendly staff is available to go over any concerns or questions you might have. Give us a call or drop us an email and let us help you find just what you’re looking for.